Struggling to complete your PayTech Awards nominations on time? Great news! 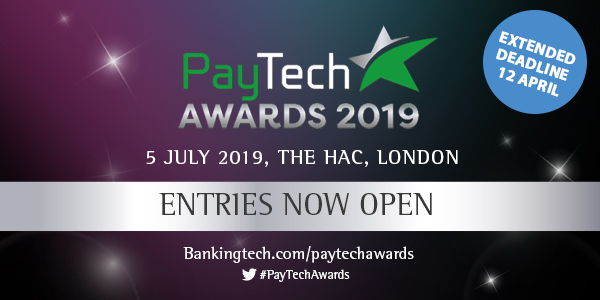 The deadline to enter PayTech Awards is being extended. The final chance to enter the Awards is now Friday, 12 April 2019! Nominate projects, products, services or partnerships for a Judged Award or tell us about inspirational people by nominating them for a Leadership Award. Are you an independent software vendor, integrator or consultancy with a trophy-worthy project? Enter the Ovum payments Innovation Award! Full details on how to enter along with criteria can be found in our entry guide. The awards ceremony will take place on 5 July in London. For more information about the Awards or sponsorship opportunities, please get in touch with Jon Robson on jon.robson@knect365.com or call +44 (0) 203 377 3327. Check out all the best bits from last year’s event in the video below!